Images via Doubleday and Riverhead. Welcome to Jezebel’s monthly book roundup, highlighting new and newish books that should be on your radar. 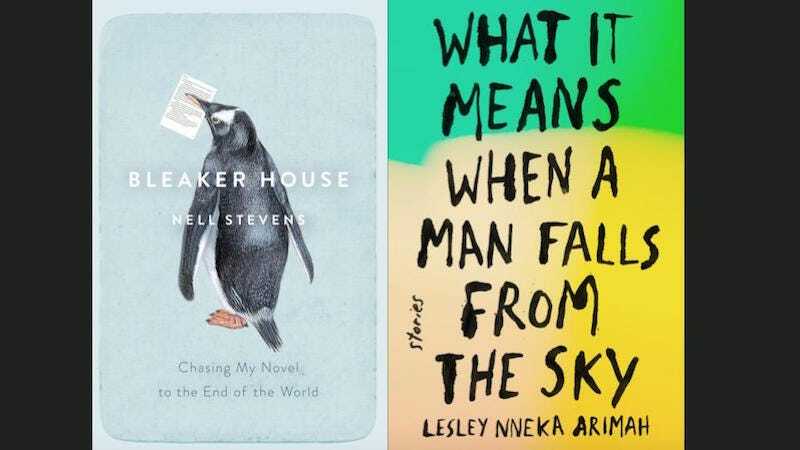 For April, I’ve chosen Nell Stevens’s part-memoir, part-travelogue, Bleaker House: Chasing My Novel to the End of the World and Lesley Nneka Arimah’s wonderful collection of short stories, What It Means When a Man Falls From the Sky. When at 27 years old with a recently finished MFA, Nell Stevens was offered a grant to go practically anywhere in the world and work on a novel, she jumped at the opportunity. Though Stevens could have gone anywhere—a tropical island or a scenic mountaintop—she chose instead to spend three months on Bleaker Island, a remote outpost of the already remote Falkland Islands. Stevens believes that in the extreme isolation of Bleaker Island, unfettered by distractions like the internet or grocery stores or other people, she can finally transform herself into a writer, a novelist in particular which, despite her degree, the label, she suggests, still somehow eludes her. In order to become what she so desperately wants to be, she charts an extreme path, choosing loneliness and isolation. “I do not want to have a nice time,” she writes. “What I need—is to have the kind of time that I can convert into a book.” She also believes that Bleaker Island will be the perfect setting for her yet-to-be-written novel. Armed with a laptop that only has a download of the movie adaptation of Eat, Pray, Love for entertainment, packets of unsatisfying food, and a kind of hazy literary determination, Stevens arrives on the appropriately named island. “Bleaker than what?” she asks herself since there is really no one else around to ask. The answer Stevens offers is that “it is just bleaker.” “I am colder, hungrier, more isolated. There is an unspoken final clause: than ever before,” she adds. The irony of Stevens’s trip is that it does not produce the novel that she’s so desperate to write. Instead, her loneliness and isolation produce Bleaker House, an odd but compelling book that exists somewhere between the intersection of fiction, memoir, and travelogue. The chapters alternate between Stevens’s life in London (she’s British), to her MFA program in Boston, sketches of the people she encounters on the Falklands before making her way out to its outer edges, and pieces of the abandoned novel that she worked on while living in what amounts to a shack on the unforgiving island. Stevens’s desperation to become who she wants to be, mixed with her literal hunger and self-imposed solitude, results in a book that’s simultaneously smart, lively and even, at points, unhinged. Stevens’s title, Bleaker House, purposefully conjures up Charles Dickens and, indeed, there’s something alluringly Victorian about the whole book. As a travelogue, Stevens occupies the space of an explorer—like the 19th-century naturalists that she alludes to—though her space of exploration is herself and that strange beast of creativity rather than the flora and fauna that occupied Charles Darwin, perhaps the Falklands most famous explorer. In our increasingly small and connected world, narratives that tackle the peculiar senses of loneliness and remove, and the effects they have on our the self, are increasingly rare. Stevens clearly knows the literature (she subsequently earned a PhD in Victorian literature) and handles her subject with appropriate awareness. As such, Bleaker House never devolves into a stunt book. Instead, Stevens charts a path of personal and professional exploration tinged with both sadness and humor. Lesley Nneka Arimah’s book of short stories has gotten a lot of pre-publication buzz. It’s been named by numerous publications, from Buzzfeed to The Millions, as one of their “most anticipated books” of the year and Arimah’s What It Means When a Man Falls From the Sky is truly deserving of all of the attention that it’s already received. The slim volume, a collection of 12 stories, “interrogates the Nigerian experience, exploring the past, present and future,” she writes. Arimah, who was born in Nigeria and emigrated to the United States when she was a teenager, has a gift for the uncanny, breathing life into metaphors, and finding meaning in both. Most of Arimah’s stories are about women and though the stories in the collection are not linked, what is consistent is Arimah’s gift at rendering textured worlds and inhabitants who hew closely to magical realism while resisting the pitfalls of the genre. In one story, “Who Will Greet You at Home,” a lonely and impoverished Ogechi weaves a baby from leftover hair gathered from the floor of the beauty salon where she works. Ogechi’s loneliness and the child she weaves exact strange prices, taking both joy and life. In the titular short story, the young Nneoma is “one of the fifty-seven registered Mathematicians who specialized in calculating grief.” In “War Stories,” Arimah explore the conflicts between girls and the rift between daughters and parents. It’s hard to stress how well written each of the short stories in this collection are—how striking and memorable they truly are—without resorting to cliches (which I won’t bore you with). Arimah is truly a master of the form and in What It Means When a Man Falls From the Sky, she displays that mastery with such compelling self-assuredness and with such creative empathy, that it’s hard to put the collection down until you’ve read and re-read every story.